Here we are on the eve of yet another Valentines Day. It’s also a Friday. Combine that with everyone rushing home to start their weekend, a quick trip to grab a card, chocolate and over-priced flowers, and you’ve got a recipe for a really frustrating start to the weekend. No fear…I got you. We’re going to MAKE some chocolates that are easy, beautiful and WAY better than anything you can get in a heart-shaped box. All you have to do is pass the brightly colored promo aisle and head for a couple of the regular aisles. We’re making chocolate clusters and Brigadeiros, a favorite from Brazil. You can find everything you need in your favorite grocery store, and you’ll have a nice batch of handmade chocolate before you go to bed tonight. If you’re giving them away, you’ll score major points with your sweetie and if you’re currently unattached, you’ll have sweet dreams knowing there are some delicious chocolates just waiting to add a little sweetness to your day! I’m a huge fan of treating yourself. 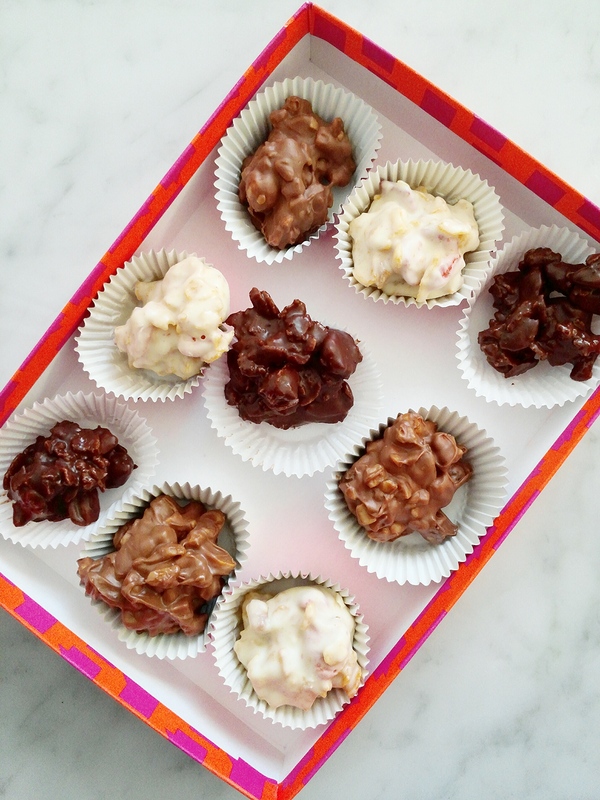 You’ll also want to grab a box of cornflakes to make the crunchy part of the chocolate clusters, and hit up the gift section to find a cute box, maybe some ribbon or a bow and that card you were going to grab. Now, on to the recipes and photos. We’ll start with the chocolate clusters. Mix the strawberries, 1/4 cup cornflake crunch and melted chocolate gently, then drop by teaspoonfuls onto parchment paper. Let sit for 15-20 minutes or until set. Drop into mini muffin papers. Combine 2 T. rum in a small bowl with ¼ cup raisins. Let sit for 5-7 minutes. Drain. Melt milk chocolate in the same way as above. Combine ¼ c. toffee bits, toasted cashews and raisins with melted chocolate. Drop by teaspoonfuls onto parchment. Let sit for 15-20 minutes until set. Drop into mini muffin papers. Toast ¼ c. pecans in oven for about 8 minutes until they smell toasty. Let cool. Melt dark chocolate in the same way as above. Combine ¼ c. cornflake crunch, toasted pecans and a pinch of cayenne (up to 1/8 teaspoon) with melted chocolate. Drop by teaspoonfuls onto parchment. Let sit for 15-20 minutes or until set. Drop into mini muffin papers. And that’s all there is to making the clusters. Package them in a cute box with a ribbon or a bow, and get prepared to receive high praise. You can even call yourself a chocolatier if you’d like. And now, on to the Brigadeiros! Using a little softened butter, grease a large plate. Carefully pour the mix onto the plate to cool. Meanwhile, place desired toppings (chopped nuts, toffee bits, coconut, sprinkles, crushed cookies, etc) in small bowls for rolling. Sprinkles are traditional in Brasil, but get creative! 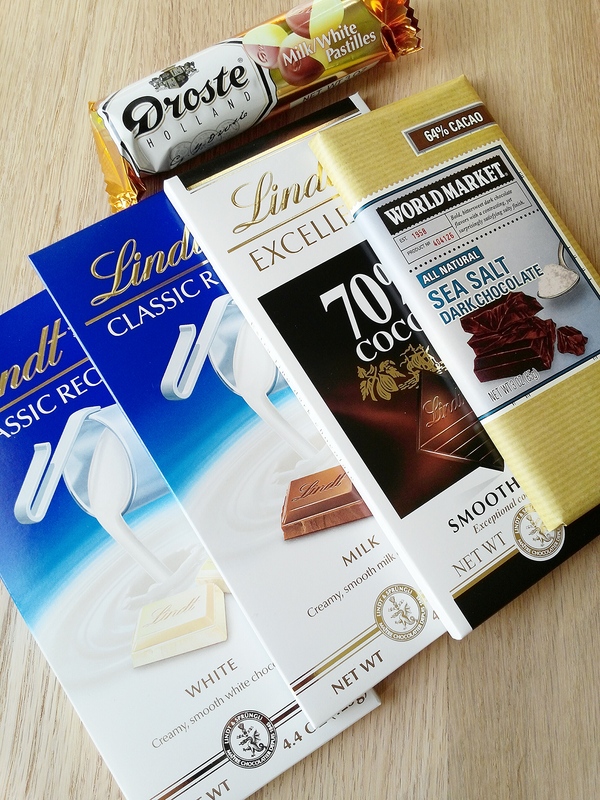 Anything that goes well with chocolate will work here. Place several mini muffin papers on a plate to get ready for the finished candies. Once the chocolate mix has cooled, grease hands with a little softened butter or flavorless coconut oil (I used it and it worked well!). Scoop into balls using a teaspoon and roll gently in palms then drop immediately into topping of choice. Roll in toppings and drop in muffin papers. Repeat until all of the chocolate is rolled and topped. This recipe is pretty quick and only took about 30 minutes from start to finish! Just like the chocolate clusters, these can be packed in a box, topped with a bow, and proudly presented to your person of choice. Now that Valentine’s Day is saved, treat yourself to some samples. You know, for quality control reasons. Someone has to check, right?